Sign Up for CALCOG News Updates Here! Gas Tax Swap Passes both Senate & Assembly! The Gas Tax Swap passed both houses last night. The Senate voted on the AB 105 first, passing it 39 to 0. It then moved over to the Assembly (surprisingly quickly), where it passed 69-4. Although nothing is a done deal until its sent to the Governor and is signed, this is very good news. Members who reached out to their Legislators should take the time to thank their members–they are not likely to get a lot of “thank yous” after this budget is finished. 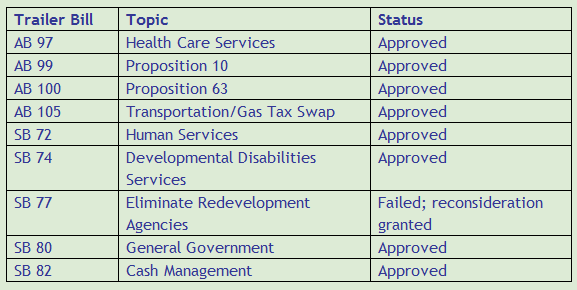 The vote to end eliminate redevelopment (SB 77) came up one vote shy of getting 2/3 approval in the Assembly. Chris Norby (R, Orange County) is the lone Republican who voted for the bill. But the bill will be up again as soon as today. Last night, Governor Brown was in the Speaker’s offices meeting with individual members to help get the required number of votes. SB 77 Language DOES NOT include COG Pass-Through for L&M Funds. The version that the Assembly voted on DOES NOT INCLUDE the provision that would require COGs or RPTAs to be the pass through for Low and Moderate Income Housing Funds (As reported in the March 14 edition of CALCOG News). Our best information that the language was included in a version that was preferred by some legislators and housing advocates, but ultimately the governor’s language (which did not include the pass through language) went into the bill.